J. A. Moerenhout : Tahiti, circa 1834. Containing new documents on the physical and political geography, the language, the literature, the religion, the customs, the habits and the dress of their inhabitants; and some general considerations of their commerce, their history and their government since the most ancient times to the present. 3 Henrietta Street, London,WC2E 2LU England. gouvernement, depuis les temps les plus recu? ;s jusqu'a nos jours (two volumes in one). First identified as a surfriding report by Ben Finney: Ancient Tahitian Surfriding. J. A. Moerenhout was a merchant and diplomat travelled from Valparaiso, Chile at the end of 1828 to the Pacific islands, spending most of his onshore residence on Tahiti. His book is not a published journal, but rather a treatise composed following a return to France in 1834 and only briefly quotes from journal entries. 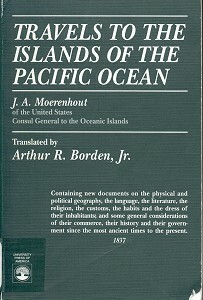 As such, the chronology is difficult to establish and Part II: Ethnography, (which contains the surfriding report) is based on the totallity of Moerenhout's readings and observations across Polynesia. While the text does make several comparative references to Hawaii (the Sandwhich Islands), Moerenhout does not specifically record his landing there. This may be indicated in the "Map drawn by Moerenhout showing the routes of the three voyages", which although listed as an illustrations as the Endplate (page ix) is not included in the 1993 edition at hand. The Hawaiian references may be derived from Moerenhout's written sources. The inclusive format adopted by Moerenhout in Part II would tend to imply the activity was widespread. There are journal entries that record a visit to Matavai Bay, the anchorage of Wallis, Cook and Bligh that had been superceded by Papatee by the time of Moerenhout's arrival, and while not recorded as a location for surfriding, its exposure to summer swells is noted..
Also note that the author's preface notes that Moerenhout had read "the works of the missionaries", including the Rev. William Ellis who reported surfriding at Fare, Huahine circa 1820. There are some similarities in the two accounts. Notes to the Author's Preface. The second will present, under the title of Ethnography, all the remarks which my long stay in these countries and my relations with the inhabitants have allowed me to gather relative to their language, their religion, and their customs. (Footnote) 4. I had at my disposal scarcely anything more than the works of the missionaries, some of which, it is true, offer interesting facts. Mr. Ellis's, among others, has often indicated to me most significant points of my research. Notes from my journal, 1829. "It was noon when I went down into the boat with one of the ship's officers, four sailors, two natives, and an Englishman who had lived for five years at Pitcairn. We sailed close to the north-north-west coast. On that day there was a strong gust from the north, which could be felt even in our water; the sea, rolling in long waves, also broke with such a din on the rocks with which the island is surrounded on all sides that it seemed unapproachable to us, even for the smallest boats. We finally arrived at the watering place, but without being able to make out the little bay on account of the violence of the waves. ... foot tall, strong as Hercules, asked for the rudder, looked at the sea, and kept us stopped for several minutes while several large waves went by, each in turn raising our boat to its crest as if to break it with the wave on the nearby rocks. After having three or four pass in that way, our young pilot, who hadn't stopped looking out at the distance, all of a sudden cried: Now, now, pull away, pull! and in less than nothing we found ourselves safe and sound in the little bay." "I had left the boat, seeing around me only rocks almost like peaks, looking for some indication of a route or some kind of path and not being able to find one, when I heard the two islanders who accompanied us cry to the sailors: Save yourselves, Save yourselves!, and, turning around, I saw a horrible wave of more than twenty feet in height rollover them. I believed them to be lost when, a moment later, to my great astonishment, I saw them get up as if nothing had happened, a maneuver which they repeated up to three times; but then the sea, a little more calm, let them recall the sailors and let them leave with the boat from that little bay, which they then said was not safe on that day." "The boarding boat waited for me. One of the natives again seized the helm to allow the boat to clear the pass, and as soon as we were led out he wished us good day and jumped into the sea. He swam in the midst of waves and breakers with a skill which you would have to see to get a true idea of, and in a few minutes we saw him safe and sound on land." Fragments from my journal, 1829. February 29. -"A strong current must have cast us to the west during the night because, in spite of the superior maneuvering of the schooner and a good breeze, in the morning we could scarcely gain the point where we had been yesterday. At nine o'clock we were in the north-east and at a little distance from the land. I then embarked in the small-boat, accompanied by three of the Pitcairn people, one of whom held the rudder, and four sailors. Four other Pitcairn people were in their two little dugouts and were to land first in order to receive our boat at the time when it would reach the reef, to draw it more easily out of the middle of the breakers." "In approaching the land our pilot had the boat stop for more than a quarter of an hour, not far from the reef, beaten by the sea with a rage which seemed not to be going to let us land, while a number of enormous sharks surrounded our boat, appearing to look at us as assured prey if the waves capsized us or broke us on the rock. Seizing a favorable moment our pilot cried to the sailors to row, and finally carried by the crest of a wave which took us at a frightful speed, we landed in a few seconds on the reef, amid floods of foam." "That day was spent in preparations. About four o'clock, when the schooner had got near the island, one of the dugouts was sent aboard with fish. I was always astonished to see these men hazard themselves in those frail boats and face the strongest wave at such a great distance from the land. they showed themselves, however, very calm, and they preferred them to the largest boats. It is true that they count much on their skill in swimming. In spite of their security I was never without fear, and was so much the more satisfied to see them return since it was the two youngest of the troop who lad been given the job." The second general observation to make on the inhabitants of the Dangerous Archipelago is that they have been accepted from time immemorial as the hardiest navigators of the area, by means of their large dugouts which often are more than a hundred feet long and are built on a plan which makes them much resemble our vessels because they have a keel, an interior timber work whose ribs determine the form of the boat, and which, bearing on the keel, have deck planks. With these dugouts they travel over the seas for several degrees around about; but as they are too narrow for their length and their height, they attach two together, and then, by means of the platform in the middle, they get in width at least a third of their length. They are pointed at both ends, and they do not tack to change direction, but they turn the sail and the rudder. At Tahiti the same boats are used for travel, but to build them they have need of the inhabitants of the low islands. They are called pahi, a name which today designates our ships. March 8 (1829). -"Yesterday morning I had noted how superior with respect to sight the islanders were who had accompanied us. They first saw the island where Mr. Brock had landed. At a distance where it was impossible for us to distinguish anything they indicated to us the precise point where that officer ocupied with the boat, and the use of the telescope proved to us the exactness of their indications. This morning, in approaching the place where a fire was still burning, we were astonished to see neither the boat nor our people. The captain and I took the telescope in turn, nothing; but our lndians, all at the same time and without hesitation, pointed out to us the west of the island, and what was our astonishment in directing the telescope to that point actually to see the boat in the open sea, but so far away that it could sarcely be discerned, even with the help of the instrument. We steered Immediately for it, and in less than a half hour our people were aboard." As for dugouts, I saw them everywhere in different shapes and different sizes, but the largest were those which they called pahi (ship) and which were used only for long voyages at sea. They have always attached two together, with a platform in the middle. These are immense boats, one of which measured seventy-five feet long and twenty-eight wide. They are built on the same plan as our ships, with a keel, but rarely of a single piece, and provided with ribs attached to the keel in a manner analogous to that by which our builders nail the ribs of our ships. (Taaroa and Taapouta of the Indians) and the neighbouring islands. As soon as it was light enough so that we could approach without danger, we steered toward the island and skirted the southeast coast about six o'clock, but nowhere did we see any trace of inhabitants or of divers. To the south-west, however, we saw five or six people together. ... the boat, and when we got very close, I recognized that it was three men, two women and a little boy, the only inhabitants of the island. Since the sea was too high to be able to land on the reef and the noise of the waves did not allow us to be heard from that distance, I gave them a signal to come, but they refused. Then my servant, born on the Marquesas, threw himself into the sea and, crossing the surf by swimming, arrived on the reef in a few minutes, where he was covered with caresses by the Indians, so gentle and simple when circumstances do not make them depart from their true character. "Nearly a year had passed and still no schooner. We were in March, had been advertised for me for December or for January. I was now certain that it was lost; what could I think of the extraordinarily delay of what had been advertised? The affair was even more disturbing since from the nineteenth to the twenty-first of February we had very rough weather during a Russian boat, the Crorky, under Captain Haguemester, had almost been lost in the bay of Matavai. These tempests, sometimes very violent, announced themselves a little in advance." Before arriving at Point Venus we drew back a distance from the coast because of a reef which extends to the east of this point nearly two miles from land, being the more dangerous in that it is still hidden under the water. I spoke in the tale of my first voyage to Tahiti of the serious damage which the Russian warship the Croky experienced there in 1830. ... what pleased them the most was to play in the water. Scarcely had it been born when the mother carried her child to the river, and from that moment on until he could take care of himself she washed him several times a day; as a result children in general knew how to swim almost as soon as they knew how to walk. 4. The fatiti achemo vaa, a dugout race. There were still a number of other common amusements, some of them daily, which didn't stop them from devoting themselves to them during solemn festivities. 3. The horoue or goroue,(19, see page 373) which consisted in letting themselves be carried by the ocean waves, keeping on the top. ... three to four feet long with which they take to the sea at a certain distance, waiting for the waves, diving under those which are not strong enough, and letting several of them roll over their heads until a very high one comes along, which cries from the spectators on the shore announce to them, always gathered in great numbers along the shore. I have seen some of them in very bad weather jump to their knees on their plank and hold themselves so in equilibrium while the flood carries them with a terrifying speed. 18. The inhabitants of the Friendly Islands attached such an importance to the construction of the dugouts intended to meet in these public contests that, after they had been launched and tried out, those which did not respond to their expectations and the speed of travel were immediately condemned and destroyed. 19. The g is pronounced as in Spanish. Geoff Cater (2008) : J.A. Moerenhout : Tahiti, circa 1834.